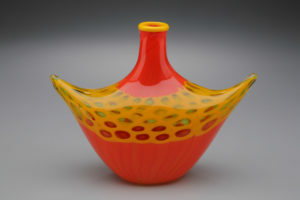 I began blowing glass in 1993. I received my training at the University of Wisconsin, where I had worked for the previous 14 years as a biological researcher. In 1997 I built a hot glass studio at my home, on a hill outside of Madison, WI, overlooking the Sugar River valley. Now I blow glass all winter and garden in the summer. I work alone in my studio, creating primarily functional pieces such as vases and bowls offhand at the furnace, using traditional tools and techniques. Development of the work is intuitive and process oriented. One idea leads indirectly into another; make a piece, react to it, try something else. Once I begin working on a form I will spend days or weeks repeating it, varying it, experimenting with color and decoration. Sometimes this leads to a logical endpoint. Other times the piece morphs into something completely different. I am always trying for a combination of color and form that will elicit a visceral response. When I get it right a new piece will make me laugh out loud. Inspiration for me comes from all directions; a dance, a painting, a sunset, a fish. I try to bring the emotion and spontaneity of a performance to the creation of a new piece. All the setup, all the test pieces and trials, are like rehearsal. When I pick up a blowpipe the curtain goes up and the world shrinks down to the droplet of fire on the end of the pipe; no stopping, no going back, total focus.